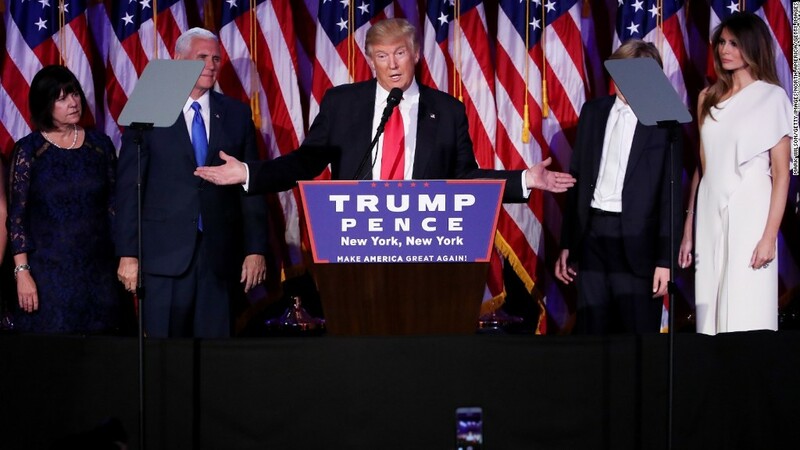 Donald Trump vowed to give Americans "the strongest economy anywhere in the world" in his victory speech on Election Night. Now he has to deliver. Step one: Boost government spending on infrastructure. Both Trump and his Democratic rival Hillary Clinton campaigned to spend more on fixing America's roads and bridges (among other infrastructure projects). Plenty of experts called it their best economic idea. "We will rebuild our infrastructure, which will become second to none," Trump reiterated in his big speech. Wall Street and business leaders cheered then and are voting with their money now. Steel and construction company stocks jumped Wednesday. Many hope infrastructure is the first item on his economic "to do" list. "We think the opportunity for a bipartisan bill on a multi-year infrastructure project is ripe for passage," says economist Joseph Brusuelas of RSM, an accounting and tax firm. "We expect [Trump's] priorities will be infrastructure spending and tax cuts," echoed Janus Capital Group. In short, infrastructure is a win-win for Trump. It's a way to extend the olive branch to Congress as well as pump more money into the economy to create more jobs and stimulate growth. The Business Roundtable, a business lobbying group, hailed Trump's "pro-growth policies" on Wednesday morning. The group said infrastructure spending and tax reform are two policies that business leaders "fully support." "My guess is a $500 billion package," says David Kotok, chairman of Cumberland Advisors in Sarasota, Florida. "With a [Republican] Senate and House, he can get it passed." Doing a bit more government spending on infrastructure is also likely to please the Federal Reserve. Trump slammed Fed chair Janet Yellen on the campaign trail, but Yellen and other Fed policymakers have been calling on Congress to do more fiscal stimulus since the Fed is nearly tapped out on ways it alone can try to increase growth and employment. Related: Will President Trump get hit with a recession? "We think the message of this election is that America demands stronger economic growth," wrote David Bianco of Deutsche Bank. He sees the election as a "'make growth priority one" mandate. Whether infrastructure spending is able to double economic growth, as Trump wants, remains to be seen. Some like Doug Holtz-Eakin of the right-leaning American Action Forum warns that it is a just temporary infusion of cash into the economy. Finding true "shovel ready" projects was also a challenge in 2009 when President Obama and Congress tried to increase infrastructure spending during the Great Recession. In the best case scenario, the infrastructure cash injection spurs more companies to spend. But it could also have the effect of lifting growth for a few quarters and then slip back to the mediocre growth of 1.5% to 2% that America has been stuck at lately. But moving quickly on infrastructure would likely ease a lot of the business world's concerns about Trump's more extreme views on trade and immigration. "Though Trump has been on the campaign trail for some two years, he still remains a staggeringly enigmatic person," writes Bernard Baumohl, chief global economist at The Economic Outlook Group.